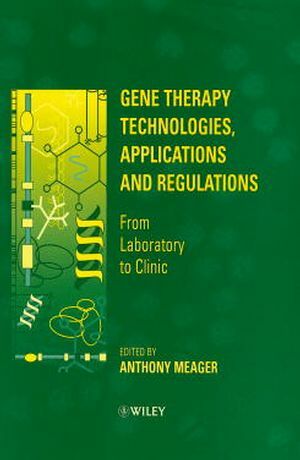 Written by international experts knowledgeable about many aspects of human somatic gene therapy, this book will be an essential guide for those embarking on gene therapy technologies relevant to specifications of production and testing of products (and procedures) required to meet existing regulations, including quality, efficacy and safety considerations. Anthony Meager is a Principal Scientist in the Division of Immunology and Endocrinology, The National Institute for Biological Standards and Control, UK. Following his PhD in Biochemistry, he has carried out research in biochemistry, cell biology, immunology, virology, and cytokines, especially interferons and tumor necrosis factor. He joined the NIBSC in 1980. Currently, he heads laboratories involved in the biological standardization of IFN and TNF, and research studies on the bioactivity and immunogenicity of cytokines. From 1990, he has also contributed to regulatory guidance on gene therapy, both for the European Medicines Agency and the World Health Organization. Cationic Liposomes for Gene Therapy Applications (J. Clancy & E. Sorscher). DNA Condensation and Receptor-mediated Gene Transfer (A. Ziady & T. Ferkol). Retroviral Vectors (W. Günzburg & B. Salmons). Adeno-associated Viral Vectors (T. Flotte & B. Carter). Advances in Engineering HSV Vectors for Gene Transfer to the Nervous System (M. Soares, et al.). Mammalian Artificial Chromosomes: Prospects for Gene Therapy (T. Ebersole & C. Farr). Gene Therapy for Severe Combined Immunodeficiency (A. Thrasher, et al.). Gene Therapy for Haemophilia (R. Hoeben, et al.). Cystic Fibrosis: Gene Therapy Approaches (N. Caplen). Therapeutic Approaches to Haemoglobinopathies (Y. Beuzard). Gene Therapy Approaches to Duchenne Muscular Dystrophy (S. Murphy & G. Dickson). Lysosomal Storage Diseases (L. Lashford, et al.). Prospects for Gene Therapy of HIV Infections and AIDS (C. Lee, et al.). The Developemnt of the Regulatory Process in Europe for Biological Medicines: How it Affects Gene Therapy Products (A. Meager, et al.). Developement and Regulation of Gene Therapy Drugs in Germany (K. Cichutek). The Transfer of Technology from the Laboratory to the Clinic: In Process Controls and Final Product Testing (F. Borellini & J. Ostrove). Good Laboratory Practice in the Research and Development Laboratory (A. Shepherd). Facilities for Large-scale Production of Vectors Under GMP Conditions (J. Boyd).